Back in the lap of luxury. Variety is the spice of life, except when you want to review a pie. I know, I’m your hero. You’re Welcome. Before we get into the review let me remind you of a couple of the rules that surround a ‘luxury’ pie. Firstly no brown sauce should be required and secondly as you are paying more than for your usual scotch pie the overall quality should be of a higher standard. So without much further ado. let’s rate some pie! 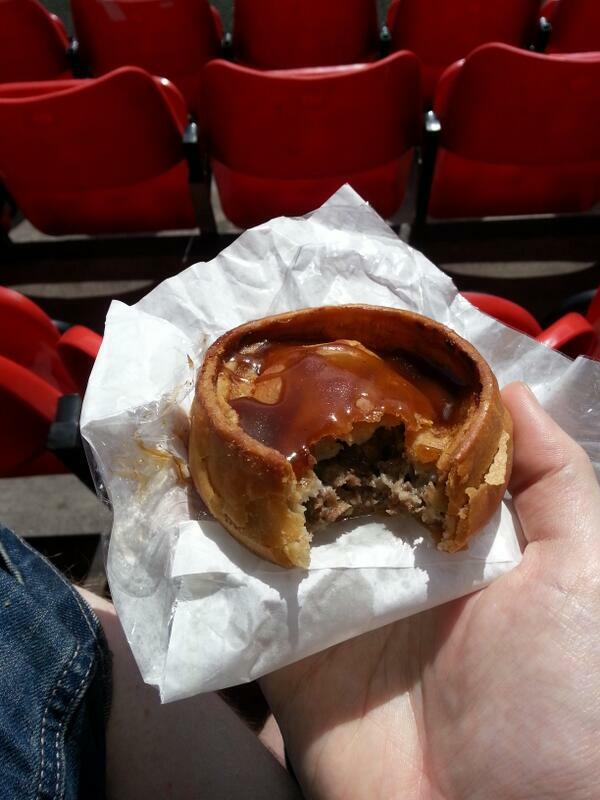 Presentation: Identical in presentation to the Cowdenbeath Scotch Pie, presented in a silver tin foil case with a medium size white napkin, sufficient enough coverage of the case to prevent you dropping the pie due to excessive heat. 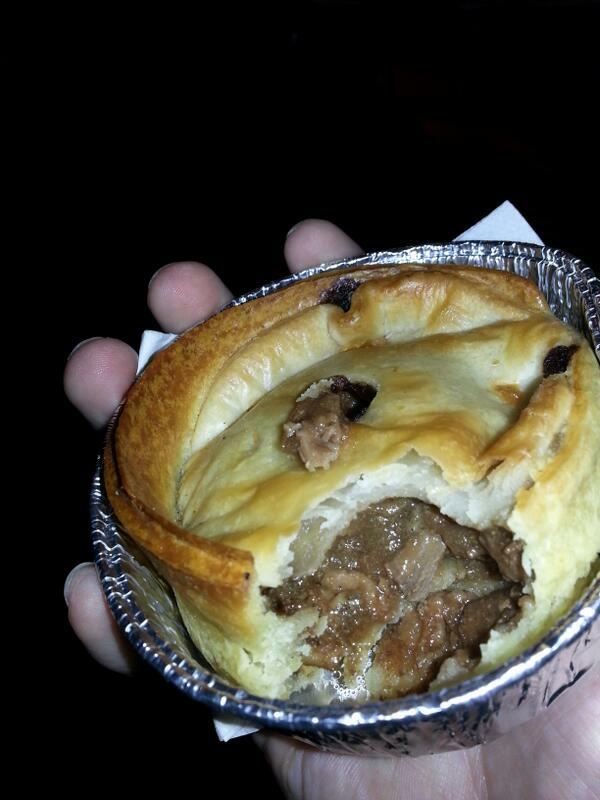 Meatiness: The steak inside the pie was smaller chunked than you would usually find in pies of similar ilk and also seemed to have some coarse mince running through it as well. I took this as an indication that the meat inside was incredibly fall apart tender something that I am happy to confirm after taking that first bite. The gravy was rich and flavoursome and was of a consistency that was sufficient to coat the meat and also ooze a little from the pastry without being runny and causing puddles in the tinfoil casing. Pastry: The pastry was cooked well, with the underside of the top part of the casing willing enough to absorb that lovely gravy. Unfortunately it had caught a little on the bottom which meant that when I went to pick up the pie for it’s first bite I left 75% of it in the case! Once again, not a massive flavour flaw but more of a potential distraction when trying to watch a game of football. I am however happy to share a couple of tips I have used in the past to resolve this issue. Tip 1: Break a piece of the outer crust off, if baked well enough this should be sturdy enough to use as a pastry spoon to scoop out that meaty goodness. Tip 2: Eat all the topping of the pie using your fingers ensuring you have sufficient napkin support for the inevitable mess you get yourself into. Once the majority of the filling has been devoured use the now softened base to wrap up the remaining filling into a Steak and Gravy Taco. In this instance I went for the pastry spoon option which worked just fine. 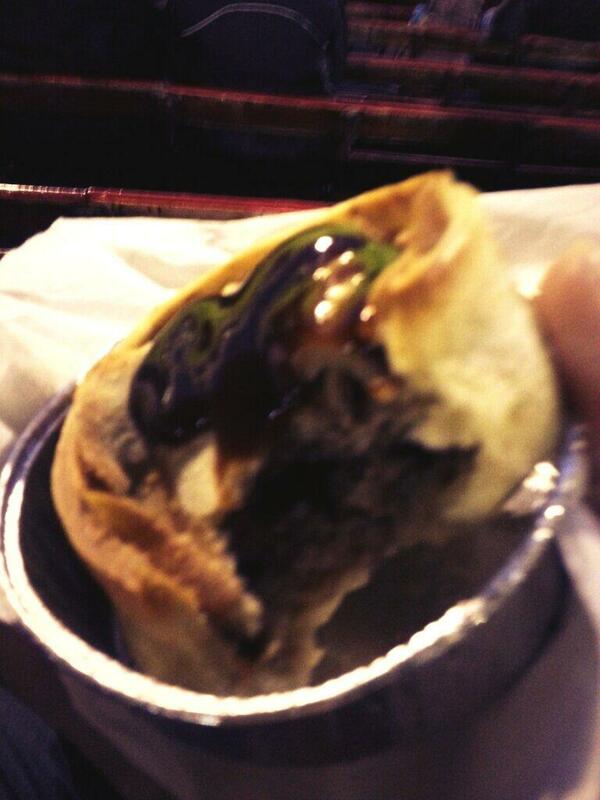 Overall: A tasty steak pie, with a well flavoured gravy meaning adding brown sauce never entered my mind. the meat was tender and well textured. The pastry fell apart a bit but as this was once again consumed before kick off provided an amusing aside to the pre-match routine. Gravy Factor: Tasty but messy gravy although sometimes that’s the best way for it to be. So that’s another pie quaffed, that’s 26 for the season as we enter the winter months, so until next time go forth and eat pie. Did you know you can Subscribe to Pie? Simply click on the ‘Follow’ link on the right and you will get an email advising of the glorious news that a new pie blog is ready for your consumption and while your at it why not have a look at ‘Leading The Line’ a blog not based solely on Pies, crazy I know! The link is on the left hand side. Finally if you could take some time to visit ‘The Grambler’ or make a donation to ‘The Booby Moore Fund’ it would be most appreciated. 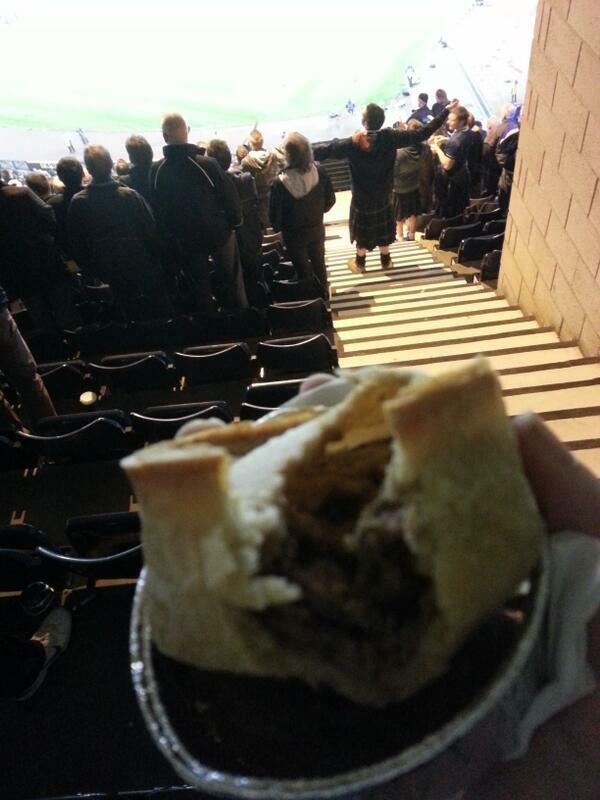 This entry was posted in Football Pies, Luxury Pies, Professional Pies, Sporting Pies, The Life of Pie and tagged Bobby Moore Fund, brown sauce, central park, cowdenbeath, dundee, Football, grambler, Gravy, hampden, ibrox, leading the line, Meat, meat filled pastries, pastry, Pie, pies, spfl, spoon, stovies. 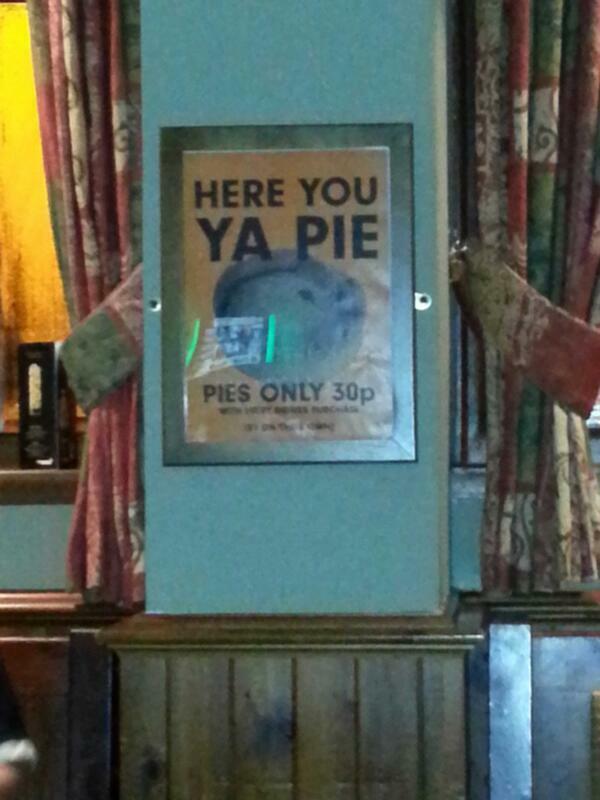 A pie worthy of a cup final. Hi again! Did you think I’d forgot about these meat flavoured beauties? If you did, you’re probably of the macaroni pie quaffing variety and have no place here. I kid, obviously, as all pie’s are welcome here but let me rationalise why this pie blog has been a few extra days in the making. 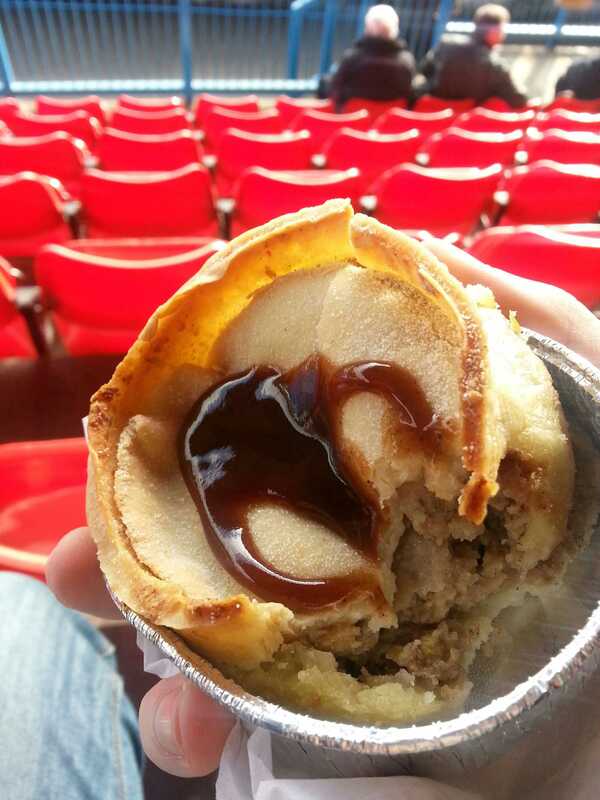 You see footballing pies have passed my lips on more than one occasion in the last week or so but a combination of work and a familiar looking fixture list meant that none of these pies have been new to the world of Meat Filled Pastries, finally on Sunday this changed. 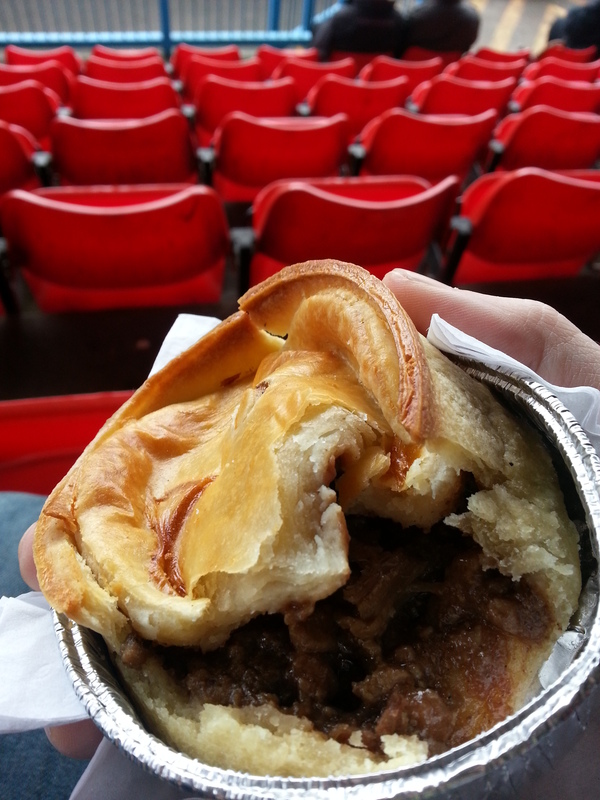 So with the kind of abandon that will be outlawed at Qatar 2022 I headed to Glasgow’s west end for a new pie adventure. Lets Rate Some Pie! 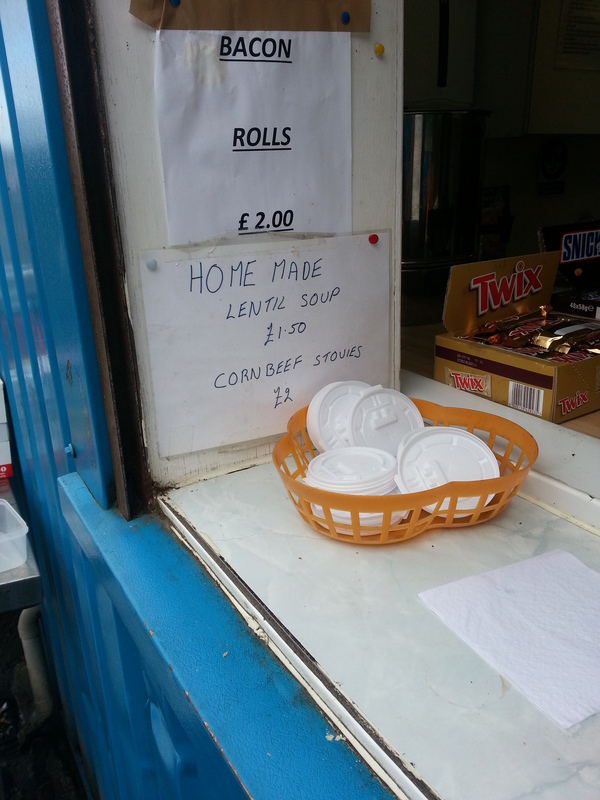 Price: £1.10, exactly half the price of the previously reviewed Hampden and Rangers Scotch Pies. Presentation: Presented within a white napkin of sufficient size that a badger could snuggly hibernate in as the winter months draw closer without it’s wee toe sticking out the bottom. This thing was huge and for that I am always grateful. Meatiness: A scotch pie rammed with muttony goodness from first bite to last in which the meat was incredibly well seasoned. The mince was coarse and importantly still had enough texture to give it a satisfying bite. I think the highest praise I can give this pie is the following antidote. 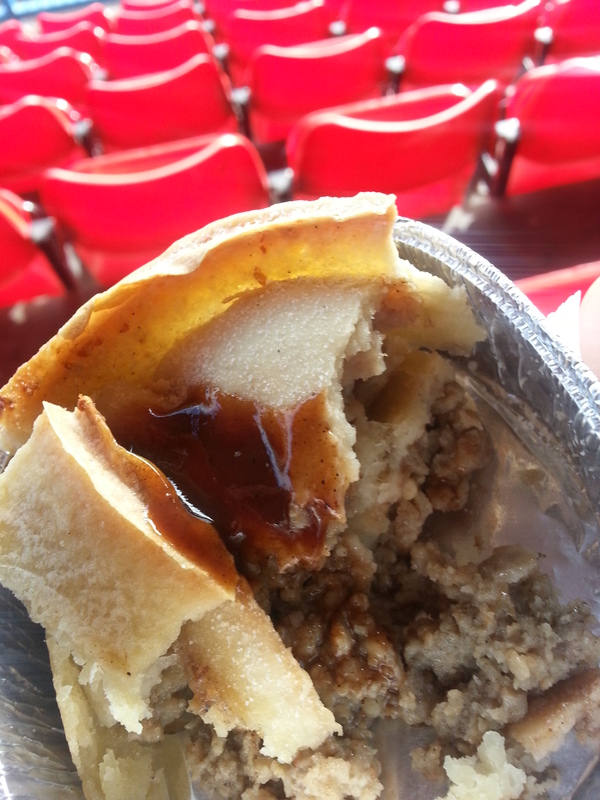 So, after consuming said pie I needed to visit the little boys room (also known as a well drained concrete wall behind the main stand), after doing the required business I started heading back to where I was standing when I suddenly noticed that the peppery after taste was still very clearly present within my mouth. With that lingering taste this pie had now marked itself out as a top contender. Pastry: The pastry was golden and cooked just to perfection, with a bite that required your teeth to break through but enough give that none of the mince inside was at risk of ending splatted on the concrete. The bake on the pastry was consistent and such was my satisfaction at my first one, I quickly purchased a second which again reached these same high standards of crispy perfection combining wonderfully again with the aforementioned meaty goodness. Overall: This was a cracking pie, great texture and meaty flavour that managed to linger long after the last bite had been devoured. A pastry shell that managed to be both soft and crispy whilst the brown sauce provided was none other than HP, a cherry meatball on top of this pie flavoured cake. Gravy Factor: The kind of gravy that you would make too much of deliberately so that after your dinner you could pour the remainder onto your plate and happily sook it all up with half a loaf of bread. 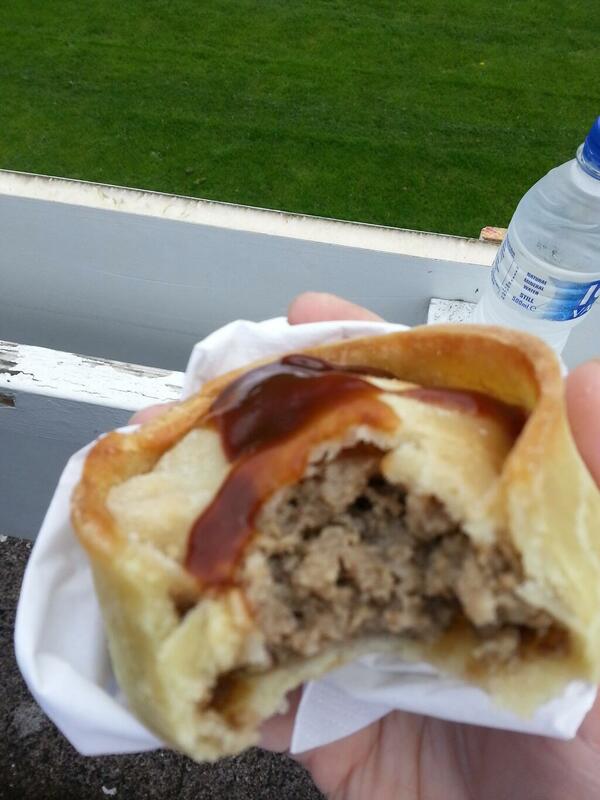 This entry was posted in Football Pies, Junior Pies, Sporting Pies, The Life of Pie and tagged brown sauce, clydebank fc, Football, Gravy, hampden, hp, junior football, maryhill fc, Meat, mince, mutton, pastry, Pie, pollok fc, rangers, sectional league cup.